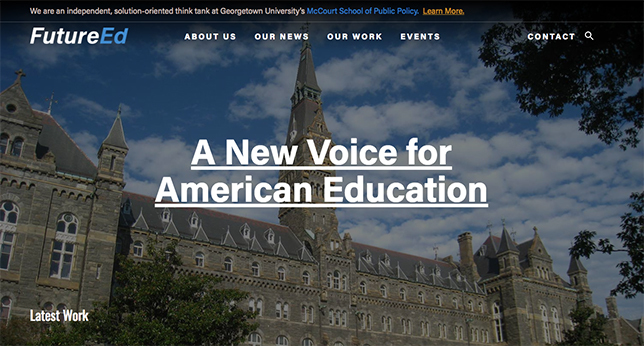 “We work to produce clear, compelling analysis on key education issues for policymakers, practitioners, the media and other key education change agents and influencers at the federal, state and local levels — promoting smart policymaking in a complex and fast-changing educational landscape,” FutureEd says on its website. The team is headed by Director Thomas Toch, who helped launch Education Week and is an education policy expert at Georgetown. Phyllis W. Jordan is editorial director and Raegen Miller is research director. Today’s reports include K–12 analysis of Indiana’s school voucher program and what it means for the Trump administration; an examination of Education Secretary Betsy DeVos’ political and education ties; and an honest look at student growth versus proficiency, an issue DeVos stumbled over during her confirmation hearing. And here’s a fun fact on the Future Ed site: The number of states with chief K–12 education officials with two or fewer years on the job is 36. The site links to other studies and analyses from researchers and various education organizations. While it currently appears focused on K–12, a number of higher ed projects are also in the works, Politico’s Morning Education reported today. Some of the foundations supporting FutureEd include the Bezos Family Foundation, the Walton Family Foundation, Carnegie Corporation of New York, the William T. Grant Foundation, the Joyce Foundation and the Raikes Foundation. To learn more about FutureEd, visit the organization’s website.